Talk about some good grub. The name of this Spanish Steak Salad is misleading. Yes, it’s a steak salad but it’s so much more. It’s not a one trick pony. Even the manliest of men would love this steak salad. It’s more like steak, with a side of salad. In fact, feel free to put the steak on the side and tell them you’ve prepped steak and salad for dinner. Issue over. Now you may think I’m a genius right about now, but a girl must protest. I just happen to have one of those manliest of men in my household. Creative thinking is required on nights when tacos, spaghetti, steak or carne asada burritos aren’t on the menu plan. You caught that did you? Carne Asada Burritos. Stay tuned to FoodieandWine.com….I’ll be sharing that one soon. 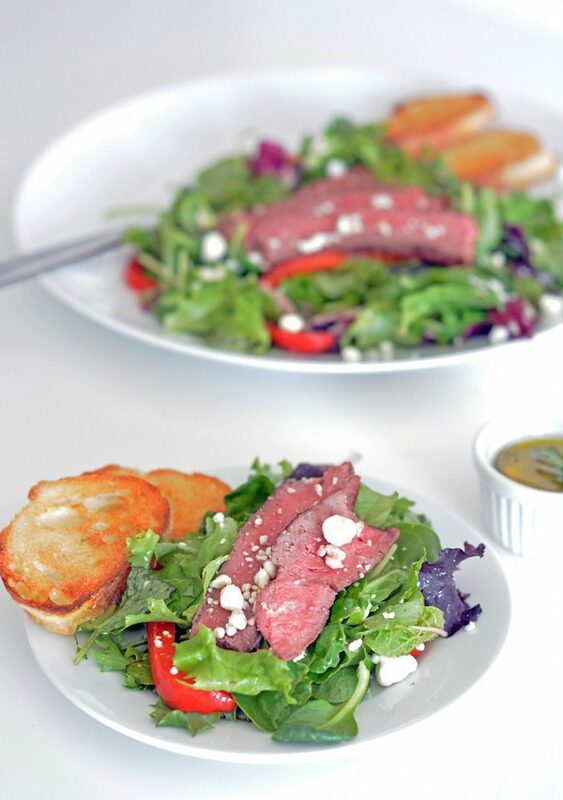 This Spanish Steak Salad is perfect for the summer because it can be eaten both warm or cold!! The baguette is totally optional. If I’m serving this for dinner, I actually pair it with my Rosemary and Garlic Dinner Rolls. The flavors of the rolls compliment the flavors of the dressing perfectly. 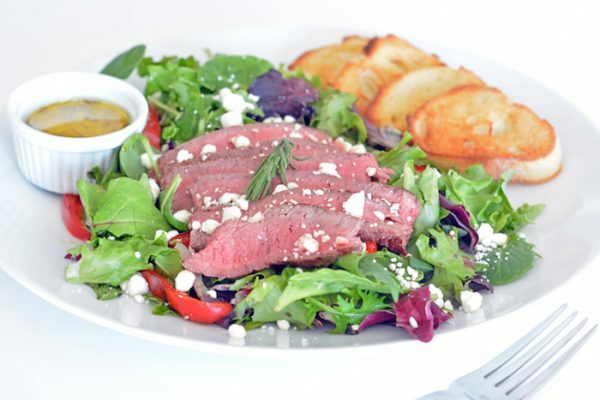 With Spring on the horizon, make sure to add this Spanish Steak Salad to your menu plan. TIP – Make this a Paleo Recipe by omitting the goat cheese and passing up the “optional” bread. Or make this a 21 Day Fix recipe by omitting just the bread. Remove steak from the refrigerator and let it come to room temperature. Strip the rosemary leaves and crush the garlic with the back of your knife. Bundle them in foil with 1/2 tablespoon of olive oil. Place on baking sheet and set aside. Cut the red pepper in strips, toss them in 1/2 tablespoon of olive oil and place on the baking sheet with the garlic and rosemary. Place in the oven and bake for 15 minutes, turning the peppers halfway through. When you turn the peppers, heat 1 tablespoon of olive oil in a medium size skillet and cook the steak 2-3 minutes per side. When you remove the peppers from the oven, replace it with the steak and roast it for 10-14 minutes, depending on how you like your steak cooked. A 1" sirloin steak took about 10 minutes to cook to medium. Prepare the dressing by mashing the garlic with a fork and chopping the rosemary leaves. Add 3 Tablespoons of white wine vinegar and 2-3 Tablespoons of olive oil (to taste). Season with salt and pepper. Prep the baguette by cutting on the diagonal and drizzling each piece with olive oil. When the steak is done, remove it from the oven and let it sit for 5 minutes. Once you remove the steak, place the baguette slices in the oven for 5-6 minutes, or until browned. Toss the greens with the dressing and red peppers and divide into 4 bowls. Slice the steak thinly across the grain and arrange over the lettuce. Top with the goat cheese and serve with the baguette slices.